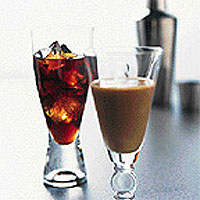 Kahlúa, a rich coffee liqueur, adds a distinctive flavour to cocktails. Use it to make a Black Russian or a richer, creamy White Russian. Place 6 ice cubes in a cocktail shaker or a tall jug. Add the Kahlúa and vodka and shake or stir well. Divide the remaining ice cubes between 4 cocktail glasses and pour in the Black Russian. Serve straight away. Place the ice cubes in a cocktail shaker or tall jug. Add the Kahlúa, vodka and cream, and shake or stir well. Pour into 4 cocktail glasses and add a swirl of extra cream to decorate. Serve straight away. For a long refreshing drink, place 3 tbsp of Kahlúa in a tall glass with 3 ice cubes. Top up with chilled cola.